"You tell him—you tell him I'm coming!" Steven Soderbergh's The Limey stars Terence Stamp as Wilson, an aging Cockney career criminal who travels to the United States seeking the man responsible for the death of his daughter. Through his daughter's friends Ed (Luis Guzman) and Elaine (Lesley Ann Warren), he locates Terry Valentine (Peter Fonda), a wealthy record producer with whom his daughter was living when she died, and sets out to confront the well-protected executive face-to-face. The film's standard revenge motif is enhanced and elevated by Soderbergh's stylish direction. The story is told in non-linear fashion, with time jumps and flashbacks integral to its overall effect—scenes of the present, the recent past, imagined moments and old memories are skillfully interwoven. Soderbergh manages these elements with clarity and thematic consistency, building a richly textured narrative that spans decades without becoming arbitrary, gimmicky or disorienting. Solid creative work all around supports the director's intentions. Cliff Martinez provides an effective musical score, and past pop hits subtly enrich the soundtrack, giving the film a sense of time and place without blatantly pushing soundtrack sales. Director of Photography Ed Lachman employs handheld cameras and casual overexposures to lend a refreshingly old-fashioned 60's "New Wave" look to the film, and the film's overall design is perfectly suited to Soderbergh's style. An innovative device uses footage from Ken Loach's 1968 film Poor Cow for flashback sequences—the earlier film also starred Stamp as a character named Wilson, and the technique works so well I didn't even think about the "gimmick" until the end credits rolled. The Limey's atmosphere is also enhanced by its talented, 60's-generation cast. Stamp portrays Wilson as a pensive man with regrets about his unresolved relationship with his late daughter—he doesn't relish violence, but sees it as his only avenue for redressing past mistakes. Peter Fonda plays an "Establishment" character who came to power in the 60's and has been completely corrupted by money, with a characterization simultaneously rooted in and at odds with his normal screen persona. Veterans Lesley Ann Warren, Barry Newman and Joe Dallesandro round out the cast, with contemporary actors Luis Guzman, Amelia Heinle and Nicky Catt providing the "new blood." The film benefits from fine performances all around, with Stamp particularly effective in quiet close-ups, sitting and thinking while his eyes and face speak volumes. Image Transfer Review: The Limey sports the best image quality I've seen to date on an Artisan disc. The film is presented in its original 1.85:1 aspect ratio, taken from a clean, almost completely speck-free print with an anamorphic transfer, downconverted from a high-definition master. Black level is solid and the film's wide range of lighting conditions are accurately captured with no artifacting or edge enhancement. Detail is outstanding, successfully reproducing the grain in the "flashbacks", and the image is very film-like; the dual-layer disc clearly allows plenty of space for a terrific, state-of-the-art transfer. Audio Transfer Review: The disc features Dolby Digital 5.1 and Dolby 2.0 Surround audio tracks, with a more compressed dynamic range on the 2.0 track for "nighttime listening." This is a relatively quiet character/dialogue film with a center-dominated soundtrack, but music reaches into the surrounds frequently and sound effects pan front-to-back when appropriate. The .1 LFE channel isn't used as much as one would expect, but music and dialogue are clean and clear and there's certainly nothing to complain about here. Bonus points for the isolated music soundtrack in Dolby 2.0. Director Steven Soderbergh and writer Lem Dobbs discuss the project's genesis, history and implementation in this screen-specific commentary. They sound like true collaborators, quick to give each other credit and proud of their combined efforts. This track is a little bit light on technical detail but does a great job of documenting the creative and artistic decisions that went into making The Limey. There are a few odd echoes, reverb variations and repeated passages—they're presumably intentional, with a 60's experimental-audio feel, but the audio "enhancements" are a little distracting the first time through. This is an interesting non-screen-specific track, assembling comments by Stamp, Fonda, Warren, Newman, Dallesandro, Soderbergh and Dobbs with a few "documentary" sound bites included. It's sometimes difficult to identify a given speaker, as no introductions or other cues are provided. Individuals (apparently recorded separately) discuss The Limey, their roles and careers, and the 60's in general—with a little more focus, this could have been a fascinating oral history. As it is, the clips are entertaining and worthwhile, but the track may be best sampled in smaller bites. This track presents the film's music with no dialogue or sound effects in Dolby 2.0 surround—great for background listening or studying Cliff Martinez' compositions. The original one-and-a-half-minute theatrical trailer is presented in 1.85:1 aspect ratio, with two 30-second TV spots in 1.33:1 full-frame. All three trailers feature Dolby 2.0 Surround audio and solid transfers. Several text screens about the making of the film, no real news. Artisan maintains a studio tradition with well-written, comprehensive bios and filmographies covering 8 cast members (Stamp, Fonda, Warren, Guzman, Newman, Dallesandro, Katt, and Heinle) and 9 crew members (Soderbergh, Dobbs, Lachman, producers John Hardy and Scott Kramer, production designer Gary Frutkoff, costume designer Louise Frogley, composer Cliff Martinez and editor Sarah Flack). A series of text screens discussing the DVD mastering process for The Limey, including the equipment and facilities employed in the transfer, with the audio engineering documented in detail by Swelltone's Larry Blake. It's good reading for the technically inclined and makes it clear that the high quality of this disc was no accident. Another innovative idea, this section presents a brief segment of the film in two versions, one in anamorphic widescreen and one utilizing 4:3 letterboxing; great for demonstrating the difference to uninitiated friends or testing your player's downconversion. A brief animated logo for Swelltone, the audio engineering company responsible for the post-production recording of the original film and the DVD audio transfer, with nice use of Dolby 5.1 audio. It's often said that the ancient Greek dramatists established all of the plots in use today. 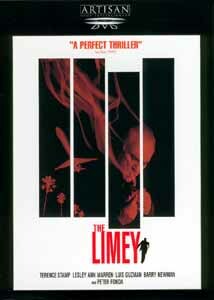 The Limey doesn't tell a new story, but it tells it with intelligence, creativity and the sheer joy of film. It's one of those rare movies that grows richer with repeated viewings, and Artisan's high quality DVD delivers a flawless transfer and solid supplements. Recommended.